Stole Details 61" Long All Together 30.5" Long On Each Side5" Bottom Width Front Ends In Point Contours To BodyStole Fabric Light weight Polyester Shiny Satin Machine Woven 155 GSM Rich In Color. Our Wholesale prices are listed in images below! Buy High School Graduation sashes , Sorority Stoles , Sorority Sashes, Custom Graduation Stoles & Graduation Sashes. 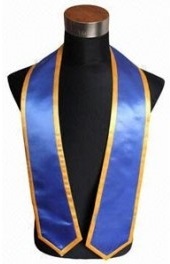 Customize A Graduation Stole with Your Colors, School Name, Greek Letters & More! Fast Shipping, Order Your Stoles Today ! •Choose from a variety of stole colors from Dropdown Box •Include your graduation year •Add your greek crest or school emblem •Custom thread colors to match your school colors •Show off your Greek Fraternity or Sorority letters •Even add your School Name ! The possibilities are endless NO Setup Charge ! Orders Shipped in 5-7 Days ! 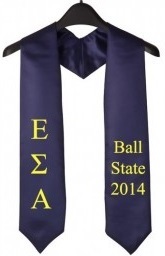 Number one Sorority sashes, sorority stoles supplier. Sorority sahes will be made from high quality satin.